A gay Tamil teenage girl living in the USA, a debater, writer, feminist, and rationalist. And oh, by the way, still in the closet. I'm here to share my thoughts, but mostly I'm just trying to figure life out. 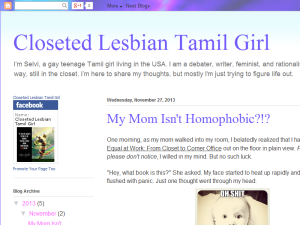 This what your Closeted Lesbian Tamil Girl Blog Ad will look like to visitors! Of course you will want to use keywords and ad targeting to get the most out of your ad campaign! So purchase an ad space today before there all gone! 2012 Election Victory for the LGBT movement! If you are the owner of Closeted Lesbian Tamil Girl, or someone who enjoys this blog why not upgrade it to a Featured Listing or Permanent Listing?